This article is about acceleration in physics. For other uses, see Acceleration (disambiguation) and Accelerate (disambiguation). In the absence of air resistance and thus terminal velocity, a falling ball would continue to accelerate. and the integral of the velocity is the distance function s(t). It can be seen that the integral of the acceleration function a(t) is the velocity function v(t); that is, the area under the curve of an acceleration vs. time (a vs. t) graph corresponds to velocity. Acceleration has the dimensions of velocity (L/T) divided by time, i.e. L T−2. The SI unit of acceleration is the metre per second squared (m s−2); or "metre per second per second", as the velocity in metres per second changes by the acceleration value, every second. An object moving in a circular motion—such as a satellite orbiting the Earth—is accelerating due to the change of direction of motion, although its speed may be constant. In this case it is said to be undergoing centripetal (directed towards the center) acceleration. where F is the net force acting on the body, m is the mass of the body, and a is the center-of-mass acceleration. As speeds approach the speed of light, relativistic effects become increasingly large. An oscillating pendulum, with velocity and acceleration marked. It experiences both tangential and centripetal acceleration. where un is the unit (inward) normal vector to the particle's trajectory (also called the principal normal), and r is its instantaneous radius of curvature based upon the osculating circle at time t. These components are called the tangential acceleration and the normal or radial acceleration (or centripetal acceleration in circular motion, see also circular motion and centripetal force). Geometrical analysis of three-dimensional space curves, which explains tangent, (principal) normal and binormal, is described by the Frenet–Serret formulas. Uniform or constant acceleration is a type of motion in which the velocity of an object changes by an equal amount in every equal time period. is the uniform rate of acceleration. In particular, the motion can be resolved into two orthogonal parts, one of constant velocity and the other according to the above equations. As Galileo showed, the net result is parabolic motion, which describes, e. g., the trajectory of a projectile in a vacuum near the surface of Earth. Kinematic vectors in plane polar coordinates. Notice the setup is not restricted to 2d space, but may represent the osculating plane plane in a point of an arbitrary curve in any higher dimension. 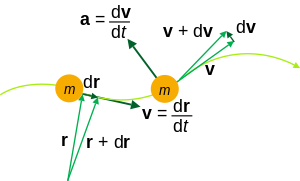 This acceleration and the mass of the particle determine the necessary centripetal force, directed toward the centre of the circle, as the net force acting on this particle to keep it in this uniform circular motion. The so-called 'centrifugal force', appearing to act outward on the body, is a so-called pseudo force experienced in the frame of reference of the body in circular motion, due to the body's linear momentum, a vector tangent to the circle of motion. ), and the tangent is of course always directed at right angles to the radius vector. The special theory of relativity describes the behavior of objects traveling relative to other objects at speeds approaching that of light in a vacuum. Newtonian mechanics is exactly revealed to be an approximation to reality, valid to great accuracy at lower speeds. As the relevant speeds increase toward the speed of light, acceleration no longer follows classical equations. As speeds approach that of light, the acceleration produced by a given force decreases, becoming infinitesimally small as light speed is approached; an object with mass can approach this speed asymptotically, but never reach it. Unless the state of motion of an object is known, it is impossible to distinguish whether an observed force is due to gravity or to acceleration—gravity and inertial acceleration have identical effects. Albert Einstein called this the equivalence principle, and said that only observers who feel no force at all—including the force of gravity—are justified in concluding that they are not accelerating. ^ Crew, Henry (2008). The Principles of Mechanics. BiblioBazaar, LLC. p. 43. ISBN 978-0-559-36871-4. ^ Bondi, Hermann (1980). Relativity and Common Sense. Courier Dover Publications. p. 3. ISBN 978-0-486-24021-3. ^ Lehrman, Robert L. (1998). Physics the Easy Way. Barron's Educational Series. p. 27. ISBN 978-0-7641-0236-3. ^ Raymond A. Serway; Chris Vuille; Jerry S. Faughn (2008). College Physics, Volume 10. Cengage. p. 32. ISBN 9780495386933. ^ Weisstein, Eric W. "Chain Rule". Wolfram MathWorld. Wolfram Research. Retrieved 2 August 2016. ^ Larry C. Andrews; Ronald L. Phillips (2003). Mathematical Techniques for Engineers and Scientists. SPIE Press. p. 164. ISBN 978-0-8194-4506-3. ^ Ch V Ramana Murthy; NC Srinivas (2001). Applied Mathematics. New Delhi: S. Chand & Co. p. 337. ISBN 978-81-219-2082-7. ^ Keith Johnson (2001). Physics for you: revised national curriculum edition for GCSE (4th ed.). Nelson Thornes. p. 135. ISBN 978-0-7487-6236-1. ^ David C. Cassidy; Gerald James Holton; F. James Rutherford (2002). Understanding physics. Birkhäuser. p. 146. ISBN 978-0-387-98756-9. Wikimedia Commons has media related to Acceleration.